In order to understand the benefits of Lean Construction, we can look at what has been observed in the performance of the construction sector. Among the elements affecting the competitiveness of companies, the various studies reveal that customer dissatisfaction is closely followed by unmet deadlines, poor workmanship and accidents. Then come the overall costs. All of these elements, which negatively impact the image of a sector, are proof that for several decades, operational performance was not the main concern and that today: “It is an opportunity”. And what if performance increased well-being, and what if quality went hand in hand with short deadlines, and what if productivity and security became a single factor. However, to get around these obstacles, the lean must simply be adapted to each situation (select and adapt the tools to each phase of a project) and manage the change (train, convince, give it meaning, etc.). In this context, Lean Construction optimizes performance by eliminating waste, both in terms of jobs (see example of improved performance in the installation of bleachers), and in terms of project management, for which controlling lead times is often the main concern (see example of a short lead time on a hospital residence). Before the Lean: 5 bleachers/day - 10.5 km/worker. After the Lean: 11 bleachers/day - 7.7 km/worker. Example: bleachers. It is possible to increase productivity on a construction site and reduce the arduous nature of work with simple, inexpensive tools made collaboratively by the workers themselves. Before the Lean: Anticipated lead time of 14 - 16 months. After the Lean: Actual lead time of 5.5 months. Example: hospital with a capacity of 80 rooms. It is a matter of managing lost time, the poor use of common workspaces and resources (stocks, tools, etc.) as well as wasted human energy (arduous working conditions and poor management of difficulties which arise). Beyond waste, Lean Construction strives to improve global performance (SQCD [safety/quality/cost/deadline]), that is to say, a performance which is not targeted on a limited objective. The reduction of costs, the quality of the construction, the quality of working conditions, productivity and meeting deadlines are at the heart of this approach which is as rigorous as it is ambitious. 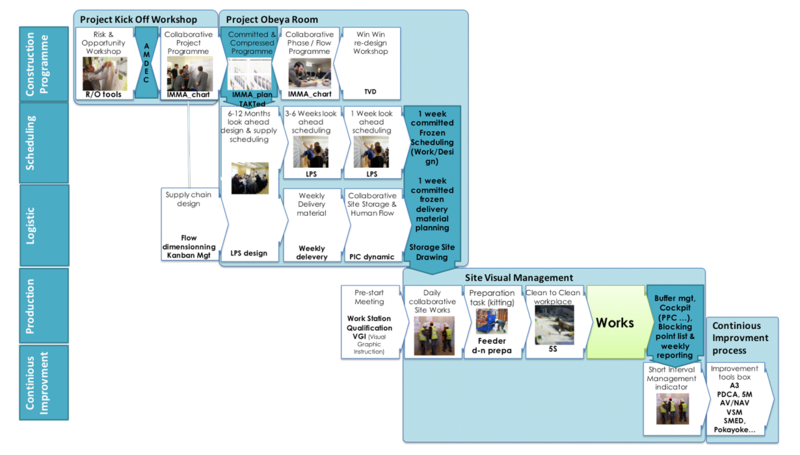 Much more than a simple tool box for improving performance, today, lean construction developed by IMMA is structured like a project management method making it possible to shorten the duration of a project through its collaborative management. The contracting authority and AMO, the architect, consultancy firms, businesses and future users of the building are involved, from the very beginning of the project and throughout its duration, in managing the project and in solving problems as they arise. This methodology radiates through a project at 360°, by allowing all actors (from the labourer to the end clients) to improve their performance, their well-being and the balance in Security - Quality - Environment - Cost & Deadline. Concretely, lean construction provides an optimized schedule in collaboration with all of the actors of the project, assimilated by all and in which studies are lead to begin construction in a timely manner. This implies respecting the daily/weekly schedule and managing common work spaces. It makes it possible to seek solutions at the time a problem arises, allows for clear visibility of the end date at all times, the management of logistics and of the handover to the operator. Lean construction makes it possible, at the individual job level, to involve workers in the continuous improvement of their tasks. How collaborative work optimize Costs, quality, security and timelines. Editions Dunod (French). 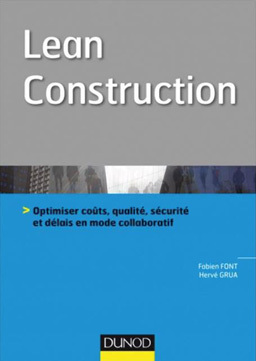 Learn more about how Lean Construction can help improve margins, timelines and security in your construction projects. This book has been co- written by our CEO Fabien Font and Hervé Grua former Industrial Director of KP1 and Plant Director of Groupe Lafarge.